In Columbus, Georgia and the surrounding areas divorce cases are handled a little differently. The “location” issue comes up frequently because of the tens of thousands of soldiers and civilian employees at Fort Benning. They come from all over the country, so when divorce and family law problems arise, their first question is: Where do I file my divorce? Is it their home state of record? Is it the county and state where they were married? Where do you live? – Georgia law (as well as most other states) bases jurisdiction of divorce cases on your domicile. Where are you currently living and do you intend to continue living there? If you are in Georgia temporarily, then this may not be the proper place to file your divorce case, and our law office may not be able to assist you. If you and your spouse live in the state of Georgia and have so resided for the past six months, then your divorce should be filed in the county where your spouse lives (assuming you’re the one filing the divorce). If you and your spouse both live in the state of Georgia and your spouse files a divorce against you, the case should be filed in your county of residence. So, your spouse has packed up and moved out? What if he or she headed out-of-state to go live with family while the divorce case sorts itself out? Where you file your divorce in that situation may be determined by how long your spouse has been gone. If you and your spouse were domiciled in the state of Georgia, and your spouse left the state during the last six months, you can still file the divorce in Georgia and bring your spouse back here to litigate any divorce and family law issues. Separated for a prolonged period of time before a divorce case is filed? If your spouse was domiciled in Georgia and left the state over six months ago, then arguably you will have to go to her new home county of residence and file your divorce case there. However, bear in mind, that if your spouse left Georgia over six months ago and files a divorce case against you in her new home county of residence, that filing would likewise be improper. It’s the defendant’s home county of residence that controls in interstate situations. So, if your spouse leaves the state for over six months and then wants to file a divorce case against you, he or she will have to come back to Georgia to litigate the divorce. What if you’re the one who moved away? Let’s say you’ve been living near Fort Lewis, Washington. Your marriage gets rocky, and the military (or a civilian employer) moves you to Columbus, Georgia or Fort Benning. Where do you file your divorce? If your spouse has not resided in Georgia and has no employment or financial ties to Georgia, then you will likely have to file your divorce case in Fort Lewis, Washington, where your spouse is domiciled. In that example, you may now have ties to the state of Georgia, but your spouse does not, and Georgia would not be able to exercise jurisdiction over him or her. One thing to bear in mind in family law cases is different types of cases have different rules for determining jurisdiction. 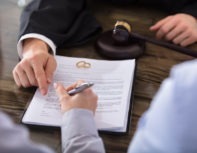 This blog post addresses where to file a divorce case. Child custody cases, legitimations, contempt actions, child support modifications, divorce by publication and other types of family law cases have their own rules for determining where they should be filed. Sometimes those rules are similar to determining jurisdiction in divorce cases; other times those rules are vastly different. Contact us to learn more about your options in divorce and to answer any of your other legal concerns.